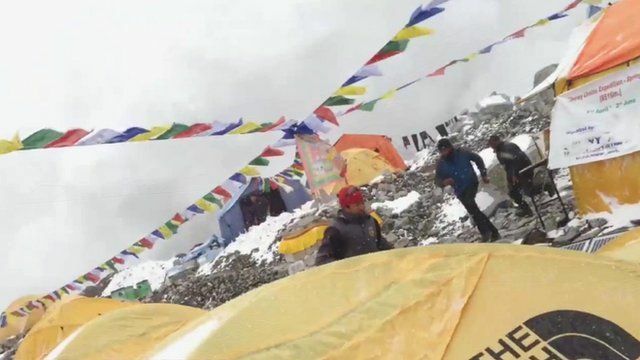 Video shows moment of Everest avalanche Jump to media player Footage has emerged from climbers on Mount Everest, showing the moment an avalanche hurtled towards them when Saturday's earthquake struck in Nepal. 'Massive damage' at quake epicentre Jump to media player A powerful earthquake has rocked central Nepal, causing extensive damage to buildings and some injuries. Frantic bid to clear tower rubble Jump to media player Efforts are under way to rescue people believed trapped under the rubble of the Dharahara tower in Kathmandu, which has been reduced to rubble by a powerful earthquake. 'The ground shook quite hard' Jump to media player A journalist based in Kathmandu explains what he saw when the 7.8 magnitude earthquake hit Nepal. Footage shows Nepal temple damage Jump to media player The Swayambhunath Temple complex is among the historic buildings in Nepal damaged by a powerful earthquake which has killed hundreds of people. Moment Nepal earthquake struck Jump to media player More than 1,500 people are believed to have died in a powerful earthquake that struck Nepal, wrecking many historic buildings. Aftershock fear in Nepal earthquake Jump to media player Rescue efforts in Nepal intensify after the country was hit by its worst earthquake in over 80 years. Footage has emerged from climbers on Mount Everest, showing the moment an avalanche hurtled towards them when Saturday's earthquake struck in Nepal. Repeated avalanches have swept away climbing ropes and ladders. At least 18 people have been killed on the mountain and more than 60 have been reported injured. The earthquake has killed more than 4,000 people across Nepal.